Renee discovered yoga in 1999 while living in Atlanta, working in the corporate world as a recruiter. It wasn’t long until she was addicted to the vinyasa flow at a charming studio where she could find stress relief and both mental and physical challenge. Renee soon spent her spare time working at the desk, trading out her time for free classes. Although she was interest in teacher training back then, it wasn’t until 2012 when Renee earned the RYT 200-hour certification through Jen Ryan at the Yoga Loft. In 2016, Renee then completed her 300-hour advanced teacher training program with her now mentor and teacher, Kristin Olson. 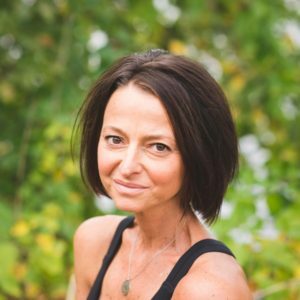 As an RYT 500-hour teacher, Renee focuses on alignment based vinyasa flow, asking her students to move mindfully and purposefully through their practice. Renee believes in a safe but challenging environment that allows her students to examine the how and why of their movements while on the mat. When Renee isn’t teaching, she might be practicing, hoping, as always, to find flexibility and patience both on and off the mat. She might also be at the beach in Maine, with her 2 sons, husband and parents. With any luck, you’ll find her doing a handstand in the sand!